Rome Colosseum Tour – Official guided Tour – Skip the line!! Rome Colosseum Tours in english !!! Rome Colosseum Tour, Official guided Tours in English, skip the line entrance, Roman Forum, Palatine Hill, tour in english, small group tour of the Colosseum..
Our tours are conducted by professional guides, licensed by the city of Rome, expert in Art History and Archaeology. 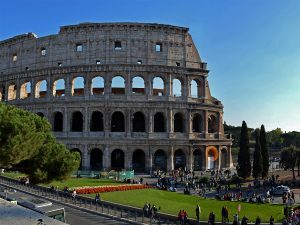 Rome Colosseum tour – Skip the lines and get the VIP entrance, in small groups, to visit the Colosseum with our official tour guides. Our tours of the Colosseum Tour also includes a visit to the Roman Forum and the Palatine Hill. Rome Colosseum Tour – A highlights walking tour through the Coliseum, the most imposing of all roman monuments, where thousands of men and wild animals were put to death before a blood-thirsty audience. Admire the incredible engineering genius of the Romans and hear about the incredible speed at which they were able to build. Learn about the mad emperors that performed in the arena as gladiators. Rome Colosseum tour – Walk through the heart of the Ancient city, the Roman Forum, where our expert tour guide will bring back to life the memories of a lost world, from the assassination of Julius Caesar to fascinating details of daily life in ancient Rome. See the very sight where the body of Julius Caesar was cremated, the Arch of Titus, the Temple of the Vestal Virgins, the Senate House, the ancient market the brothels and walk on the Via Sacra , where legions once marched during the triumphal parades. Visit the Palatine hill, the core of the Seven Hills, one of the most ancient parts of the city, where, according to the legend, in 753 BC Romulus founded Rome, after killing his brother Remo. It later became a place where many Emperors built them Palaces, we will explore the vestiges of these luxurious residences that crowned the hilltop: the remains of Romulus’s hut, the House of Augustus Octavian , the private hippodrome of Domitian, the aqueduct of Claudius and much more…. Rome Colosseum Tour – Official Colosseum guided Tours. Book on line, skip the line tour, Colosseum tickets, Roman Forum, Colosseum tour in english, Vip Access !!! From the last Sunday of March until the last Saturday of October From the last Sunday of October until the last Saturday of March The Colosseum is closed January 1 and December 25. Free entrance of the first Sunday of every month, skip the line tours are not available on this day.